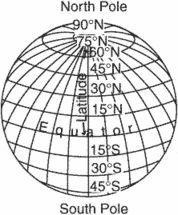 (north and south poles), the points where the earth’s imaginary axis of rotation intersects the earth’s surface and where the meridians converge. The north pole is located in the northern hemisphere, in the central part of the Arctic Ocean. The south pole is located in the southern hemisphere, on the continent of Antarctica. There is no geographic longitude at the poles, and the conventional points of the compass do not apply. The geographic poles are points on the earth’s surface that do not take part in the earth’s diurnal rotation. The position of the earth’s axis of rotation relative to the earth’s orbit is such that near the poles the sun does not rise higher than 23½°. For this reason, the climate is harsh, with low temperatures accompanied by strong winds and snowstorms. History of expeditions. Attempts to reach the north pole are inseparably linked to the history of the study and conquest of the arctic. Attempts to reach the north pole had been made by the Englishman H. Hudson in 1607 (reaching 80°23′ N lat), the Russian navigator V. Ia. Chichagov in 1766 (80°30′ N lat. ), the British explorers C. Phipps in 1773 (80”48′ N lat.) and W. Parry in 1827 (82°45′ N lat. ), and the American J. Lockwood in 1882 (83°24′ N lat.). In 1895 the Norwegian polar explorer F. Nansen and H. Johansen, a colleague, reached 86°14′ N lat. by skis and dogsled from the ship Fram, which had drifted with the ice of the Arctic Basin. In the spring of 1900 the Italian U. Cagni reached 86°34′ N lat., also by dogsled. In September 1909, F. Cook, an American, announced that he had reached the region of the north pole (about 88° N lat.) on Apr. 21, 1908, but he offered no proof. The first person to reach the north pole is therefore usually considered to be the American R. Peary, who reached 89°55’, according to optimal calculations by American experts. He did so on Apr. 6, 1909, traveling by dogsled. The development of balloons and airplanes provided entirely new ways of reaching the north pole. The first attempt to fly to the north polar region in a balloon was made in July 1897 by the Swede S. Andrée; the attempt ended tragically. The first craft to fly over the north pole were a plane piloted by the American R. Byrd (1926); the dirigible Norge, commanded by the Norwegian R. Amundsen (1926); and the dirigible Italia, under the command of the Italian U. Nobile (1928). These were all reconnaissance flights. A new period in the study of the Arctic Basin began in the spring of 1937, when O. Iu. Shmidt led a Soviet high-latitude air expedition of four heavy transport planes in the first landing on drifting ice in the north polar region. The expedition established the Severnyi Polius (SP-1) drifting station, which was manned by I. D. Papanin, E. T. Krenkel’, E. K. Fedorov, and P. P. Shirshov. In the same year, two Soviet crews made nonstop transpolar flights from Moscow to the USA. The first crew consisted of V. P. Chkalov, G. F. Baidukov, and A. V. Beliakov, and the second, of M. M. Gromov, A. B. Iumashev, and S. A. Danilin. After 1945, Soviet and American planes flew to the north pole many times and made numerous landings on drifting ice in order to study the ice. In 1958 the American atomic submarines Nautilus and Skate became the first vessels to pass under the ice of the north pole. The Nautilus traveled from the Bering Strait to the Greenland Sea, and the Skate went from the Greenland Sea to the north pole and back. In 1962 the Soviet atomic submarine Leninskii komsomol traveled to the north pole. In 1963 the crew of a second Soviet atomic submarine landed on the ice and raised the state flag of the USSR and the flag of the Soviet Navy. In 1968 a six-man American-Canadian expedition led by R. Plaistad reached the north pole from the Canadian arctic in 44 days using small motorized sleds. In 1968 and 1969 four British explorers led by W. Herbert traveled by dogsled from Point Barrow, Alaska, across the north pole to Spitsbergen, reaching the pole on Apr. 5, 1969. The first attempt to reach the south pole was made by the British explorer R. Scott, together with E. Shackleton and E. Wilson, in 1902. Between 1907 and 1909, Shackleton made a second attempt and reached 88°23’ S lat., but he was forced to return owing to a shortage of food. The first expedition to actually reach the south pole was a Norwegian expedition led by R. Amundsen. Amundsen arrived at the pole on Dec. 14, 1911, one month before R. Scott’s British expedition arrived on Jan. 18, 1912. As aviation developed in the 1930’s, a new period in antarctic research began. Admiral R. Byrd, an American, became the first to reach the south pole by airplane on Nov. 29, 1929; he made a second flight in 1947. During the International Geophysical Year (1957–58), the United States established a scientific station at the south pole. On Jan. 18, 1956, during a reconnaissance flight, an American plane became the first airplane to land at the pole. In January 1957 the Amundsen-Scott Station was opened. In November 1957 an expedition composed of British and New Zealand contingents began a transcontinental journey from Shackleton Station across the south pole to Scott Station. An auxiliary tractor party led by the New Zealander E. Hillary reached the south pole from the direction of the Ross Sea on Jan. 4, 1958. On Jan. 20, 1958, the main detachment, led by the British geologist V. Fuchs, crossed the south pole. The overland crossing took 99 days. In October 1958 the Soviet pilot V. M. Perov flew an IL-12 across the continent along the route Mirnyi Station-Sovetskaia Station-south pole-McMurdo Station to study the relief of Eastern Antarctica. On Dec. 26, 1959, Soviet investigators reached the south pole in tractors and sledges, using the route Komsomol’skaia Station-Vostok Station-south pole. The team was led by A. G. Dralkin, head of the Fourth Antarctic Expedition. In 1961, A. Crary led a group of American scientists on an intracontinental trip in all-purpose vehicles along the route McMurdo Station-south pole. Vize, V. Iu. Moria Sovetskoi Arktiki: Ocherki po istorii issledovaniia[3rd ed.]. Moscow-Leningrad, 1948. Zubov, N. N. V tsentre Arktiki: Ocherki po istorii issledovaniia i fizicheskoi geografii Tsentral’noi Arktiki. Moscow-Leningrad, 1948. Laktionov, A. F. Severnyi polius[3rd ed.]. Moscow, 1960. Motrokhov, A. N. “Sovetskie podvodniki na Severnom poliuse.” Morskoi sbornik, 1964, no. 2. Papanin, I. D. Zhizn’ na l’dine: Dnevnik Moscow, 1972. Scott, R. F. Posledniaia ekspeditsiia R. Skotta. Moscow, 1955. Treshnikov, A. F. Istoriia otkrytiia i issledovaniia Antarktidy. Moscow, 1963. Fuchs, V. E., and E. Hillary. The Crossing of Antarctica. London, 1958. Movement of the geographic poles. The instantaneous axis of earth rotation does not always maintain the same direction in the earth. As a result, the geographic poles shift across the earth’s surface, a phenomenon known as polar motion. Data on polar motion is important in astronomy and geodesy because the movement causes continuous changes in the coordinates of points on the earth’s surface and the azimuths of terrestrial objects, thus affecting astronomical and geodetic measurements. To obtain data on polar motion, the International Latitude Service was established in 1899; in 1961 it was renamed the International Polar Motion Service. The service has five stations that make observations of latitudinal changes and a central bureau that computes the coordinates of the geographic poles on the basis of these data. The stations are all located at 39°8’ N lat. and have identical instruments. They are in Mizusawa (Japan), Kitab (USSR), Carloforte (Italy), and Gaithersburg and Ukiah (USA). Observations for the polar motion service are also conducted in the USSR in Pulkovo, Moscow, Poltava, Kazan, Gorky, Irkutsk, and Blagoveshchensk. 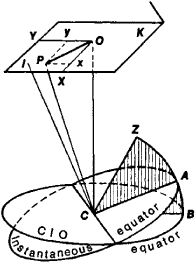 where λ is the longitude of the observation point. Data on polar motion show that pole P moves across the surface of the earth in the direction of the earth’s diurnal roation around the pole of inertia I, where the least axis of the earth’s ellipsoid of inertia intersects plane K. Pole P thereby describes an irregular spiral-like curve—a polhode—whose loops shift gradually in the direction of Greenland relative to the Conventional International Origin O. The polhode of the south pole has the same shape as that of the north pole. The periodic constituent of polar motion consists of two parts: free movement and annual movement. Free movement, or free nutation, is movement approximating a circle, with a period of 1.2 years. The amplitude of the free movement of the geographic poles varies greatly, approaching 0.3” at the maximum—as in 1910, 1955, and 1965—and decreasing to near zero at the minimum—as in 1927, 1935, 1961, and 1968. The annual movement of the geographic poles follows an ellipse whose semiaxes have been defined by A. Ia. Orlov as equal to 0.088” and 0.075”; 1” corresponds to approximately 31 m on the earth’s surface. Various models of the earth have been proposed in the theory of polar motion. Assuming the earth to be an absolutely solid body, L. Euler derived a formula, published in 1790, that related the period of free movement of the geographic poles to the values of the principal moments of the earth’s inertia, from which it followed that this period would be 305 days; this is termed the Euler period. In reality, as the American astronomer S. Chandler established by analysis of observations in 1892, the period is significantly larger, close to 433 days; this is termed the Chandler period. S. Newcomb attributed the discrepancy between the Euler and Chandler periods to the effect of elastic deformations of the earth and the shifts of water in the ocean. These shifts result from changes in centrifugal force caused by polar motion. Newcomb’s explanation established the dependence of the period of free movement of the geographic poles on the mechanical properties of the earth. It also pointed to the possibility of using data on this movement to study the internal structure of the earth. Specifically, these data were used to test the inferences of the theory of rotation of a liquid-core earth by F. A. Sludskii, J. H. Poincaré, H. Jeffreys, M. S. Molodenskii, and others. This theory holds that in addition to the above-mentioned constituents of the poles’ movement there can be a movement with a period of approximately 24 hours; according to Molodenskii’s calculations, it is 23 hr 56 min 54 sec of sidereal time. N. A. Popov confirmed the existence of such a movement through observations of two zenith stars at Poltava. The annual movement of the geographic poles is caused by the seasonal redistribution of mass—primarily masses of air—on the earth’s surface, which alters the centrifugal moments of inertia. Jeffreys ascertained that disruption of the regular annual course of this process can instigate and maintain the free movement of the poles. By contrast, the viscosity of the earth causes an attenuation of polar motion. This interpretation of the phenomenon made it possible to apply the theory of random functions to the analysis of polar motion. For each loop of the polhode a center may be found—the mean pole of the epoch of observations. The theory demonstrates that this pole must always be close to the pole of inertia I for any model of the earth. A. Ia. Orlov developed a method of computation that makes it possible to find the coordinates of the instantaneous pole relative to the mean pole of the epoch of observations directly on the basis of determinations of change in latitudes. It has been hypothesized that there were significant shifts in the geographic poles in the geological past. Scientists are attempting to use data on residual magnetism in rocks to trace the movement of the earth’s poles back to the Precambrian. Orlov, A. Ia. “Sluzhba shiroty.” Izbr. trudy, vol. 1. Kiev, 1961. Kulikov, K. A. Izmeniaemost’ shirot i dolgot. Moscow, 1962. The north or south points of intersection of the earth's surface with its axis of rotation. It is where all meridians meet. After this, the spike may have moved northwest before merging with other magnetic features near the geographic poles. Flat maps with fixed geographic poles distort which areas are parallel to one another and are therefore conducive to forming a conveyor belt between emerging and sinking crust. Magnetic poles, different from the geographic poles, are part of the magnetic field generated by liquid iron in Earth's core. Expedition leader Jim hopes to break five records and earn a place in history by becoming the first person ever to reach the arctic pole solo and unsupported, the first Briton ever to walk solo and unaided to the geographic North Pole, the first man in history to achieve it from the Canadian side and the first man to reach all four North Poles, the arctic, the magnetic, the geomagnetic and the geographic poles. He wanted to prove to himself that he had fully regained his fitness and will accompany Jim to the Arctic, the Magnetic, the Geomagnetic, and the Geographic Poles. They were also the first all-female team to walk to both geographic Poles, having conquered the South Pole in January, 2000. As the world turns, the geographic poles are the only places that face the same direction all night long. This was an indication not only that the magnetic poles might exist away from the geographic poles but that they might be shifting position as well. WANDERING POLES Draw a line between the north and south geographic poles, and it runs smack through the center of the planet. Earth's geographic poles are fairly stable, wobbling back and forth across the landscape only a few meters every year or so (SN: 8/12/00, p.
Tom Angel, 30, of Glasgow, will visit the geomagnetic, magnetic, Arctic and geographic poles during his epic journey. If Hadow succeeds, he will become the first British explorer to trek unsupported to both the North and South Geographic Poles.